WE’RE LEARNING… God made everything. God made me. 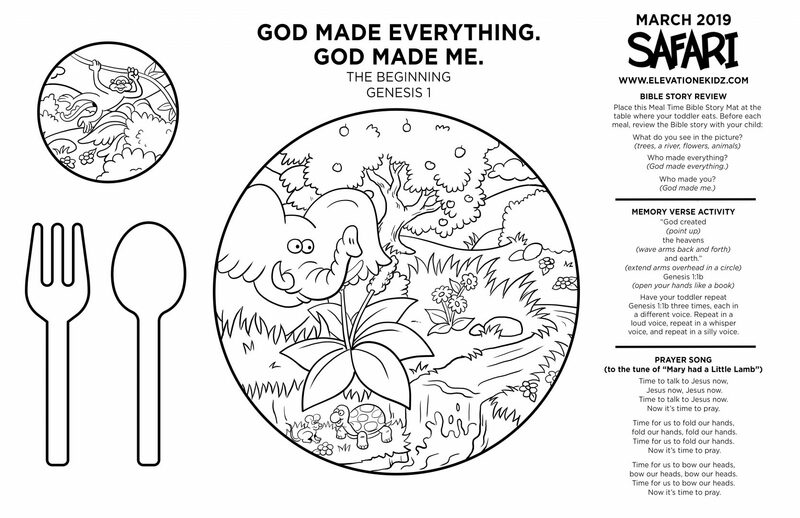 This week we sang a song to remind us that God made everything. Sing the song with your toddler at home! 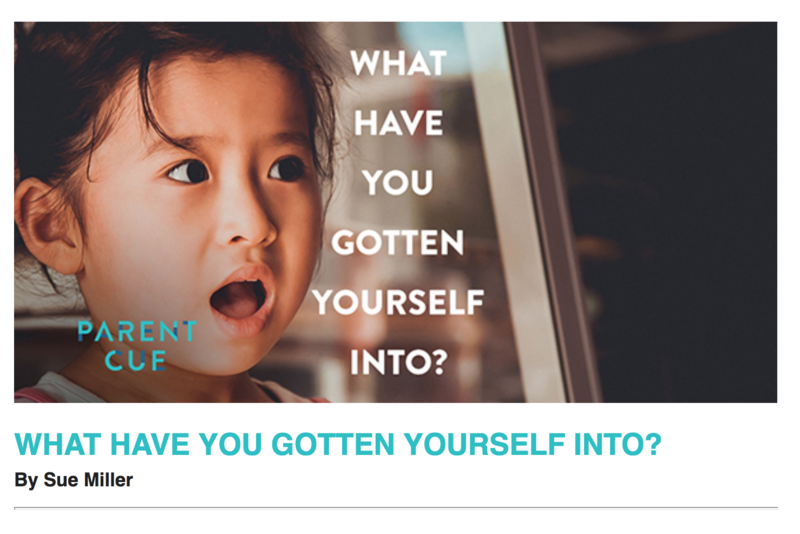 Continue the activity, but replace “me” with your toddler’s name each time it appears in the song. 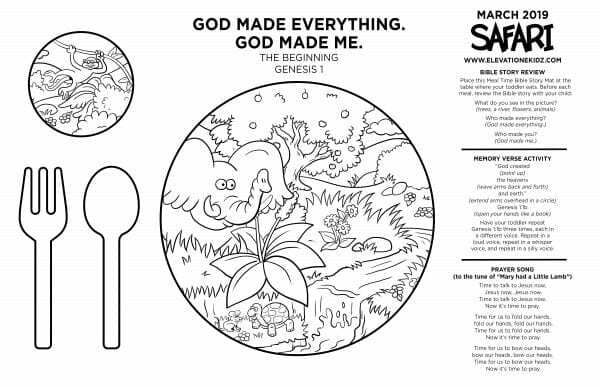 Play a fun game with your toddler to help them remember God made everything, including all of the animals! Act out an animal using actions and sounds. Encourage your toddler to guess which animal you’re pretending to be. After your toddler guesses correctly, ask, “Who made (animal acted out)?” Encourage your toddler to say, “God!” Continue the activity for as long as your toddler is interested, choosing a different animal each time. You will make mistakes as a parent. You might . . .bribe, bargain and threaten just to get in the car faster. forget that it’s Pajama day at school. order them oddly-shaped nuggets from the drive-through a few too many times. let them hold onto their pacifiers, bottles, and Wubbies a teensy bit longer than they should. Maybe you should stress less and play more, cuddle more, laugh more. . . .Just remember: Kids get messy. And so does family. Kids don’t need perfect parents to turn out great. What they do need is for you to invest in your relationship with them above all else. For more blog posts and parenting resources, visit ParentCue.org. This month we’re learning, “God made everything. God made me.” God made everything we see and He made us. God made us wonderfully and He loves us so much. We will learn the story, “The Beginning,” in Genesis 1. In the very beginning, the world was dark and empty, but God had a plan. He created day and night. He made a big blue sky, a shining sun, and puffy clouds. He even created a big ocean with lots of fish, land with flowers and tall trees, and animals to creep and crawl. But God’s favorite and best creation was people! God saw that He made everything wonderful and He rested. God made everything we see and He made you and me. He loves us so much! WE’RE LEARNING… Jesus loves me. This weekend, we made a fun craft to help us remember how much Jesus loves us!